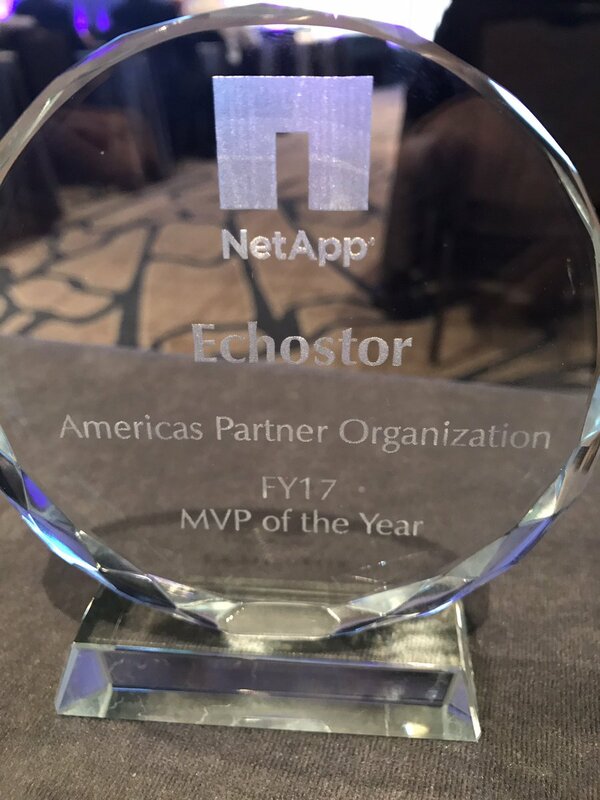 EchoStor Technologies has been named NetApp Most Valuable Partner for its overall FY18 revenue, year over year growth, key account wins and participation in regional partnership activities. EchoStor is a leading partner with NetApp focused in the New England region with customers of all sizes across many verticals. EchoStor’s deep bench of highly trained engineers gives them the ability to sell all the whole suite of NetApp products and also install and service them. The Knowledgeable sales team engages in a highly consultative approach to understanding customers’ requirements and them proposing solutions that will deliver the highest business results. Through these competencies EchoStor has been recognized for outstanding achievements in selling and supporting NetApp Products in FY 2017. The 2018 Americas Partner Awards were announced on stage at NetApp’s Channel Connect Conference (C3) where strategic partner executives from across the Americas region gathered to hear about NetApp’s strategic vision and engage with NetApp executives. If you would like more information about this topic, please contact Mark Nickerson at 508-544-1313 or email at Mark.nickerson@echostor.com.